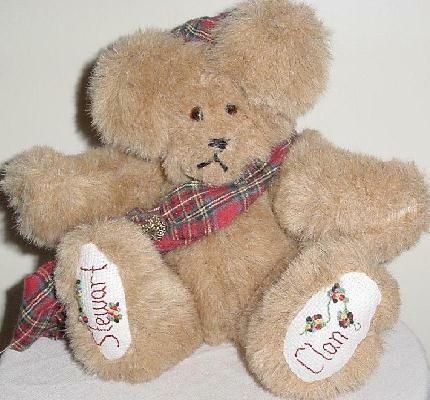 Stewart Clan Bear is an original, 10 1/2" plush, hand-made, fully jointed teddy bear. He wears the bonnet and sash of his native Scottish Stewart Clan, while his paws are embroidered with the name of the Stewart Clan. The Clan Bear is $35. Wilde & Woolly Bears: Mohair bears, Wizards, Patriotic Patrick. Santa Bear: Santas and other bears. University Bears: Baylor Bears featured.